Dunkley Music will never sell the personal information you disclose to us. The information you provide will only be used to contact you for special promotions, or to notify you of non-payment if you have an outstanding balance. We take seriously the confidence you place with us when you provide your personal information. 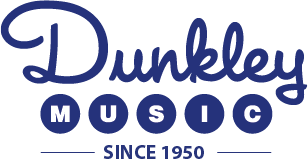 If you would like to be removed from our mailing list for promotions, please send an email to sales@dunkleymusic.com with the word "Remove" in the subject line and we will remove you from future emails and promotions.